I'm officially at the stage in my life where everyone I know is getting married. While some may feel pressured to also get married, I'm just feeling the pressure of what to wear to their weddings. I want to look cute, be comfortable and dress appropriately. I was planning on wearing this dress to my sister's rehearsal dinner but it wasn't in stock when I needed it. So I ordered it anyway and now I'm going to wear it to another wedding we have coming up. I love seersucker and anything blue, so of course this fits right in with my theme. The dress itself is so beautifully made and (!!) you don't have to wear a bra with it! It had a built in shelf (not a bra) but one that you zip together on the inside first and THEN zip the outside. It makes you feel super secure so that even though it's off-the-shoulder, it's not going anywhere. 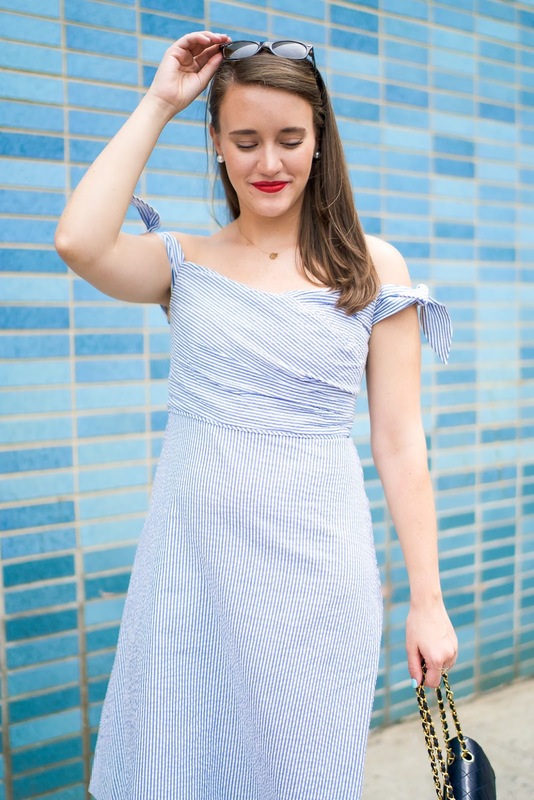 If you love this dress but want some more options, it also comes in seersucker pink, it comes completely strapless (in blue and pink seersucker again) AND it comes in non seersucker colors. So you really have some options here!